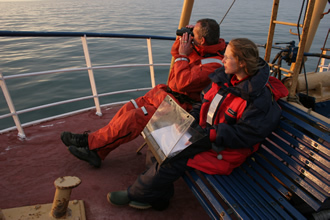 The shore-based observations were focussed on the area above the FLOWBEC platform. Shore-based observational surveys were used to record the abundance and behaviour of black guillemots and European shags on the sea surface within the study area. A suitable vantage point was located on a hilltop overlooking the Billia Croo wave test site. Scans were only performed when the sea state was <Beaufort scale 3, and visibility was >1.5 km. During each scan, the abundance of foraging seabirds across the study area was recorded. No more than four hours of survey per day, to reduce the effects of observer fatigue. EMEC Billia Croo High-Intensity Wildlife Observation Data is located in United Kingdom.